Stream anime episodes online for free, Watch One piece Episode 71 English version online and free episodes. Anime Episode guide One piece Episode 71 English dubbed Huge Duel! The Giants Dorry and Broggy! The giant introduces himself as Broggy, claiming to be the strongest warrior of Elbaf, and asks Nami and Usopp for booze. Frightened, the two play dead. Broggy takes them to his place, where he roasts dinosaur meat to treat them as his guests. They however, fearing to be eaten themselves, try to escape through the jungle, but, after being chased by large predators, they end up back at Broggy’s camp. 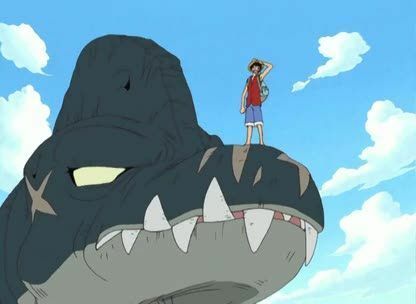 Elsewhere, Luffy and Vivi meet Dorry, another giant and Broggy’s rival, who tells them that they are engaged in a one hundred years long duel. Whenever the island’s central volcano erupts, the two face each other in combat. Meanwhile in the jungle, the Mr. 5 pair joins forces with Mr. 3, who plots to earn the giants’ huge bounties.